My son is very much into dinosaurs. And dirt. 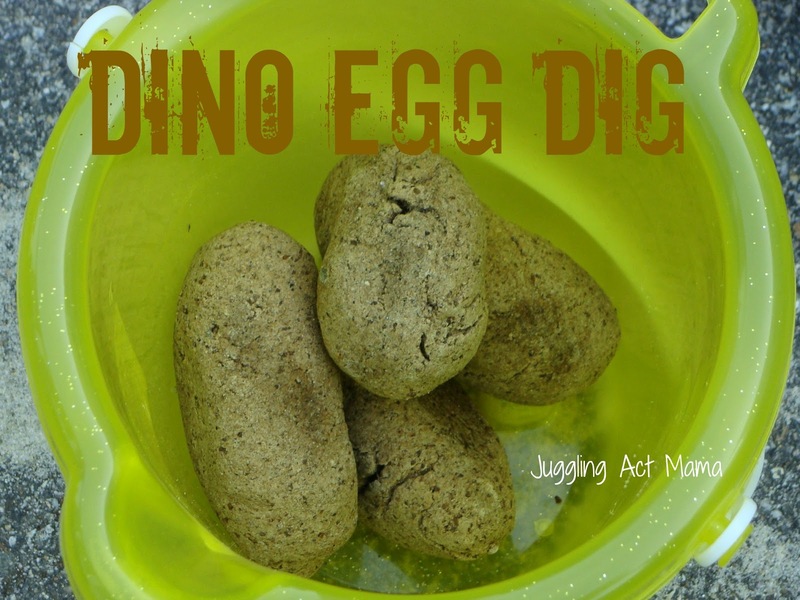 So, when I saw this project over at Miss Information’s blog, I knew we had to give it a try. We invited our friends Jacob and Alex over and got messy! Preheat the oven to 250-degrees and line a cookie sheet with parchment paper. 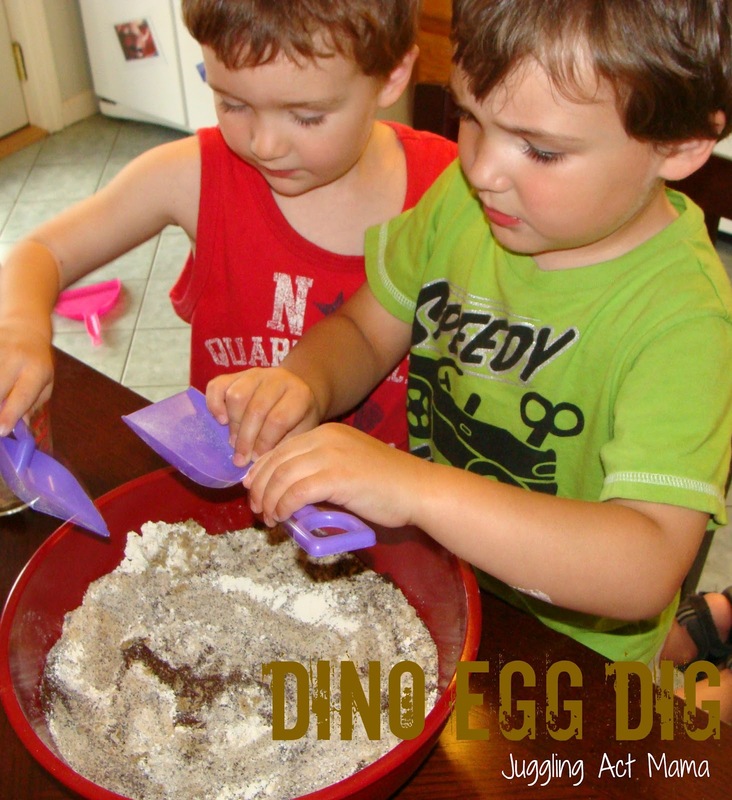 In a large bowl, mix together the sand, flour, coffee grounds and water. Use your hands to kneed the dough until it is all combined. The dough should feel like gritty playdough. Flatten small pieces of dough and then wrap them around the dinosaur, forming an egg shape… depending on the shape of your dinosaur, your egg may be rounder or more oval. Just a note about your dinosaurs – you need really, really small ones… the ones we started with were way too big and the eggs were enormous! Bake for 20 minutes, then turn over. Bake for another 20 minutes. Let the eggs cool and finish hardening overnight. 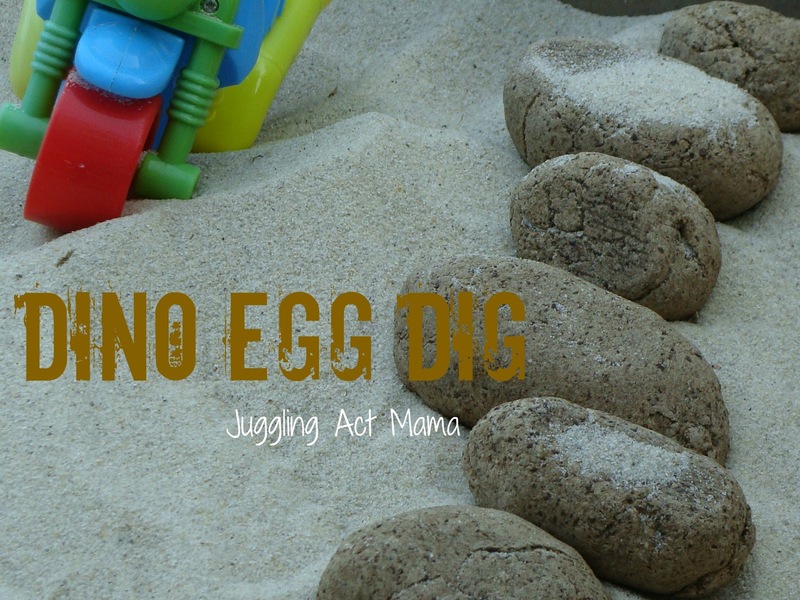 Hide the eggs in a sandbox (count them first!) and let the kids dig for them. Ethan and Jacob actually buried and dug up their eggs a couple of times…. there were only 2 eggs that wandered off, later to be found in another part of the yard. Opps. Oliva (17mo) and Alex (11mo) had fun putting the eggs into the pail, and taking them back out. And eating sand… I suppose that’s inevitable. 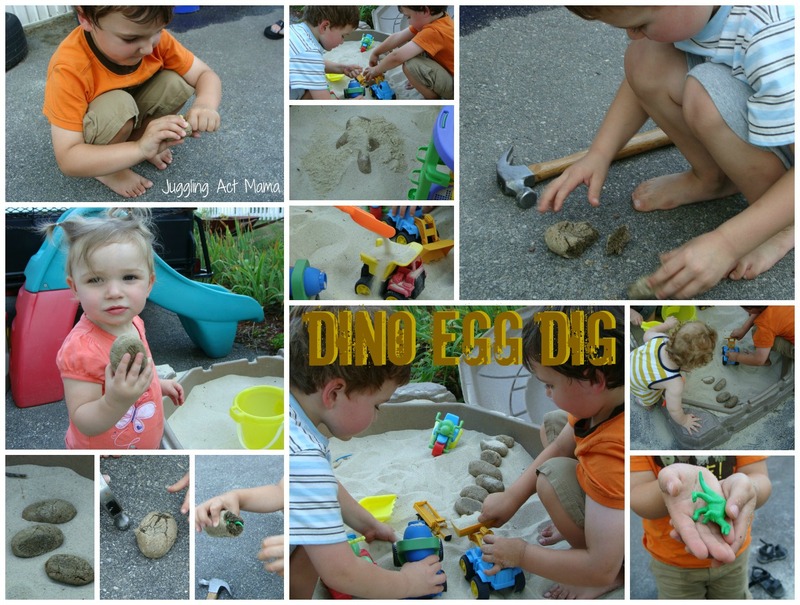 Once all the eggs have been collected, use a hammer to crack them open and ‘hatch’ the dinosaur. Some of our eggs were pretty easy to open – Jacob was able to pull one apart with his hands. 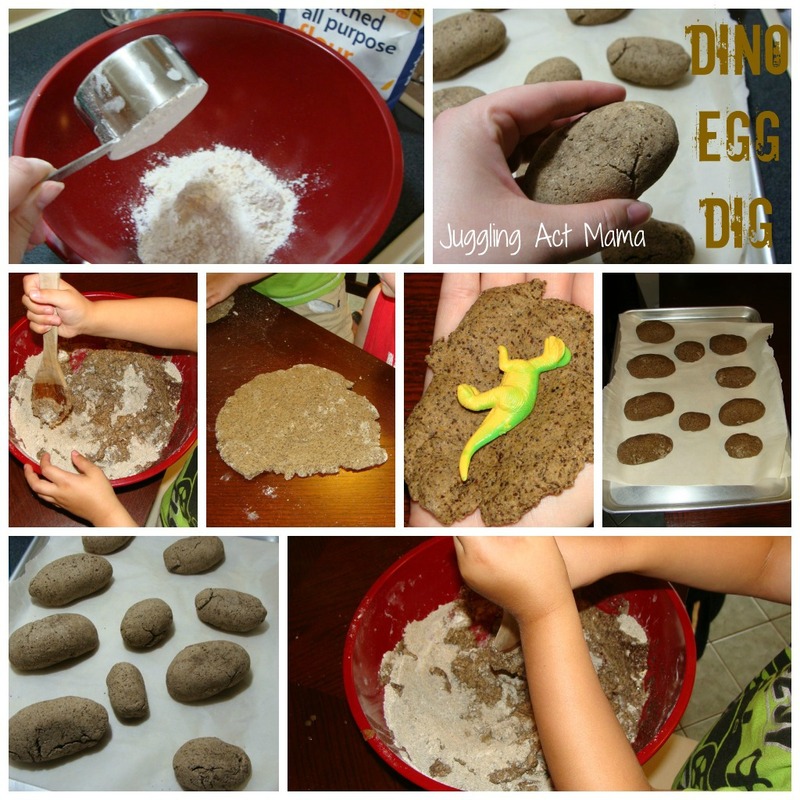 I hope you’ll try this fun activity with your kids, and if you do, be sure to let me know how it turned out. My sons would LOVE this but do you know if this will work with out coffee grounds?